Thousands of protesters have taken to Poland's streets over the signing of an international treaty activists say amounts to internet censorship. Prime Minister Donald Tusk's government signed the Anti-Counterfeiting Trade Agreement in Tokyo on Thursday. The treaty, known as Acta, aims to establish international standards to enforce intellectual property rights. But critics say it could curb freedom of expression, and government websites have been hacked in protest. Later on Thursday, hundreds of people took to the streets of the eastern city of Lublin to express their anger over the treaty. Several marches had taken place in cities across the nation on Wednesday, says the BBC's Adam Easton in Warsaw. After convening a special government meeting to discuss the issue, Mr Tusk said the government would not be blackmailed by the treaty's opponents. There would be ample time for public discussion about the treaty before it was ratified by the Polish parliament, he said. Poland was one of several European Union countries, including Finland, France, Ireland, Italy, Portugal, Romania and Greece, to sign the treaty on Thursday but it appeared to be the only place where it caused protest. The agreement was signed by the US, Australia, Canada, Japan, Morocco, New Zealand, Singapore and South Korea last year. 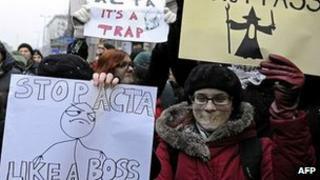 Acta shares similarities with America's Stop Online Piracy Act, which US lawmakers set aside last week after Wikipedia and Google blacked out or partially obscured their websites for a day in protest.